The Postmatic Stamp Affixing Attachments work in conjunction with any of our Inline Stamping Bases providing a proven solution for high speed, high volume stamp affixing inline with inserters, ink jets systems, labelers or off-line as stand alone. These same stamp affixers can convert your existing Pitney Bowes or Ascom Hasler mailing machine into a high production postage stamp affixer. The Stamp Affixers will apply stamps from coils of 3,000 or 10,000 at speeds up to 18,000 per hour. Installation is fast and easy. Simply place stamp affixer on the host machine and your affixing postage stamps as fast as that machine will run. The Model 6000SA or Model 7000SA Stamp Affixer will drop right onto any of our Inline Stamping Bases with no modifications or alterations. This combination works well with high speed inserters, ink-jet systems, labelers or tabbers. 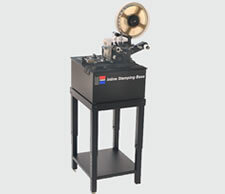 Eliminates the extra steps needed when applying stamps with tabbers.